I stopped to see two of the great mediaeval castles of Co Meath, and one late mediaeval wayside cross on my way to the Station House Hotel in Kilmessan yesterday afternoon [12 June 2015]. Killeen Castle and Dunsany Castle are a pair of neighbouring castles on either side of what was once a major mediaeval roadway, and both are associated with the Plunkett family, once a powerful family in the area. Killeen Castle near Dunsany stands on a site where there has been a castle for almost 850 years, since about 1172. The present castle is the restoration of a largely 19th century castle that suffered severe fire damage in 1981. The first castle at Killeen may have been a Norman wooden fortification oden, built for the de Lacy magnates, and held from 1172 by the Cusack family. The first stone castle was built by Geoffrey de Cusack around 1181. Killeen Castle passed to the Plunkett family in 1399 through the marriage of Lady Joan de Cusack and Christopher Plunkett of Rathregan, who became the first Baron of Killeen in 1426. He divided his estate between his eldest two sons, the second son taking Dunsany Castle, and later becoming the first Lord Dunsany while the elder branch of the family continued as Barons of Killeen, and later Earls of Fingall. Killeen Castle was developed over time, and by the 15th century it was a mid-size fortified tower house. The Killeen and Dunsany branches of the Plunkett family remained close through the centuries and it is said that at one time the Dunsany branch held Killeen in trust for the elder branch. Luke Plunkett, 10th Lord Killeen, was given title of Earl of Fingall in 1628. It is said he negotiated and bought the earldom for £2,700 during a visit to London that year. His first wife, Lady Elizabeth O’Donnell, was a daughter of Rory O’Donnell, 1st Earl of Tyrconnel, and a niece of Red Hugh O’Donnell. However, Killeen Castle fell into disrepair in the late 17th century. It was leased out, and was not restored until around 1779, when parts of the demesne were landscaped and some of the estate features were added. Significant reworking was carried out between 1803 and 1813 under the supervision of the Gothic revival architect Francis Johnston. The 8th Earl of Fingall was also given a British peerage title as Baron Fingall in 1831. In 1841, much of Killeen Castle was demolished and rebuilt (using much existing material) by the 9th Earl of Fingall, supposedly as a small Windsor Castle. The two towers he added are inscribed with the the dates 1181 and 1841, and when the rebuilt castle was completed it was said that Killeen Castle had 365 windows, one for each day of the year. The 12th and last Earl of Fingall sold Killeen Castle and the estate in 1951, to Sir Victor Sassoon (1881-1961). But Lord Fingall stayed on as the manager of the stud farm established near the castle. In 1953, the Earl and Countess of Fingall moved to a modern house built on the lands, and most of the contents of the house were sold too. Sir Victor Sassoon, who was born in Naples, was a member of, a Baghdadi Jewish family who had made their fortune in the opium trade and Indian cotton. He had vast merchant and banking interests in Bombay, Poona, Baghdad, Shanghai, Hong Kong, Japan and the Bahamas, and at one time owned over 1,800 properties in Shanghai. Sassoon died in 1961 and his heirs sold the estate in 1963 to Daniel Wildenstein, a French art dealer and racehorse owner. When the last earl died in 1984 he was buried nearby at Dunsany Church. At his death all three titles in his branch of the Plunkett family died out. Meanwhile, Killeen Castle and estate were sold in 1978 to the advertiser Basil Brindley, who continued to run the stud farm operation. On 16 May 1981, the castle was destroyed in an arson attack, and was left abandoned for many years. The lands and buildings were sold again in 1989 to Christopher Slattery, who initiated new development plans. In 1989, a new development plan was put forward, and an 18-hole championship golf course designed by Jack Nicklaus opened in 2008. Behind the castle and the golf club stand the ruins of Killeen Church, known locally as Killeen Abbey. The church, dedicated to the Blessed Virgin Mary, was built in the Gothic style around 1425, and is a National Monument, but it was locked on Friday afternoon and it was not possible gain access. From Killeen Castle, I continued on to the entrances to neighbouring Dunsany Castle. The original Dunsany Castle was built in 1180 or 1181 by Hugh de Lacy. The castle was built to replace earlier motte fortifications, and it claims to be the oldest home in continuous occupation in Ireland, having been held by the Cusack and Plunkett families, to the present day. The Dunsany branch of the Plunkett family enjoyed almost uninterrupted ownership of Dunsany Castle, apart from the Cromwellian period, when they were sent into exile in Connaught. The Dunsany Estate was reduced in size under the terms of Land Acts passed in the late 19th and early 20th century. But the castle is still surrounded by its original demesne, and other estate lands remain around the district. Much of the work of the writer Lord Dunsany was done at the Castle, notably in a room in one of the castle towers. The demesne is surrounded by a drystone wall, much of which was built during the Great Famine as a relief work. The main entrance to the grounds today, opposite a mediaeval pilgrim cross, has the appearance of a Gothic ruin but this is a sham, concealing a residential gate lodge, and with a solid black metal gate. Just behind this is the former Steward’s House. The former main gateway, leading to a long avenue which abruptly reveals the castle to arrivals, has a tower lodge and high white gates. Although Dunsany Castle is supposed to be open to visitors in the summer months, there was no entrance sign. Instead, I was able to spend some time admiring Dunsany Wayside Cross, a late 16th or early 17th century decorated cross opposite the gateway. This is one of a small number of Wayside Crosses in Co Meath that have survived from the later mediaeval period. The cross is carved from limestone and has a rectangular shaft set in a large rectangular base with the upper shaft of the cross set in a collar. The cross is Latin style. On the west face is a panel with the winged ox of Saint Luke above a crucifixion. There is no inscription, but it was probably erected to commemorate one of the Plunketts of Dunsany Castle. The first Baron of Dunsany was Sir Christopher Plunkett, second son of Christopher Plunkett, 1st Baron Killeen. However, there is confusion among historians when it comes to the date the title of Lord Dunsany was first given, ranging from 1439 to 1461, 1462 or even as late as 1489. John Plunkett, 3rd Lord Dunsany, supported the pretender Lambert Simnel, while Robert Plunkett, 5th Lord Dunsany, was accused of complicity in the rebellion of Silken Thomas FitzGerald. Randall Plunkett, 11th Lord Dunsany, was a supporter of James II and was outlawed by William III, but he regained his estates after the Treaty of Limerick. Edward Plunkett (1713-1781), 12th Lord Dunsany, conformed to the Church of Ireland never took the steps needed to take his seat in the Irish House of Lords. John William Plunkett (1853-1899), 17th Lord Dunsany was a Conservative MP for Gloucestershire South, while his brother, Horace Plunkett, was a key figure in the development of Irish agriculture and the Irish co-operative movement. Edward John Moreton Drax Plunkett, 18th Lord Dunsany (1878-1957) was a writer and dramatist who published more than 80 books, as well as short stories, plays, novels and essays. He worked closely with WB Yeats, whose 150th birthday is being celebrated throughout Ireland today [13 June 2015] and Lady Gregory, received an honorary doctorate from Trinity College, Dublin, and was chess and pistol-shooting champion of Ireland. Today, the title is held by Randal Plunkett, 21st Baron of Dunsany, who succeeded in 2011, and continues to live at Dunsany Castle. From the gates of Dunsany Castle, we drove on to the Station House Hotel in Kilmessan. There was more of mediaeval Meath to see later in the weekend. Today marks the 150th anniversary of the birth of the poet William Butler Yeats, who was born in Sandymount Avenue, Co Dublin, on 13 June 1865. He was a driving force behind the Irish Literary Revival, one of the founders of the Abbey Theatre, and the first writer to receive the Nobel Prize for Literature. Much is being written, said and performed to mark this anniversary, and it is interesting to note how a Dublin-born poet is being presented as a son of Sligo. His mother was from Sligo, but the myth that he was from Sligo has been helped this year by the visit of Prince Charles to the grave of Yeats in Drumcliffe churchyard. The myth was also recycled by Leonard Cohen at a concert in Lissadell House in July 2010. It was a night of poetry and music beneath the slops of Ben Bulben and Cohen was visiting the house where Yeats stayed when he visited the Gore-Booth sisters, the young Eva and the future Countess Constance Markievicz. Perhaps Yeats would have enjoyed this too as someone who worked and reworked Irish myths and legends in his poetry. When the future poet was only a child of two, the Yeats family moved to England in 1867 and in 1877 he was sent to the Godolphin School in Hammersmith, where he spent almost four years. Although family holidays were spent at his mother’s family home in Sligo, he was born in Dublin and spent most of his childhood years in London. 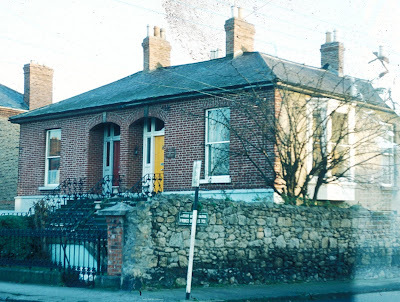 When the family returned to Dublin in 1880, and they lived in Howth, first at Balscadden Cottage and then at Island View, Howth, before moving in 1883 to 10 Ashfield Terrace, now 418 Harold’s Cross Road. Later my father grew up around the corner in Ashdale Park. But Yeats was ashamed of his family’s home between Terenure and Harold’s Cross, describing it in 1914 as “a villa where the red bricks were made pretentious and vulgar with streaks of grey slate.” Perhaps this explains why he fostered the myth that he was from Sligo and not from Dublin – or from London. In Dublin, Yeats was sent to the High School, then on Harcourt Street. Despite some misconceptions, he was never a student at Trinity College Dublin – from 1884 to 1886, he was a student at the Metropolitan School of Art, now the National College of Art and Design (NCAD). After seven years, the family returned to London in 1887. Two years later, in 1889, he met Maud Gonne, who was English-born without any Irish ancestry. In 1891, he visited Gonne in Ireland, where she rejected his proposal of marriage. He would propose to her three more times – in 1899, 1900 and 1901, but she rejected him each time in 1903 married Major John MacBride. John MacBride had been executed for his role in the Easter Rising, and Yeats made one last proposal to Maud Gonne in mid-1916. Then in 1917, he proposed to her 21-year-old daughter, Iseult Gonne. Later that year he proposed to 25-year-old Georgie Hyde-Lees, and they were married on 20 October 1917. At first, TS Eliot expressed distaste for Yeats, and even mocked Yeats’s membership of the Theosophical Society. Later, following his attendance at the first performance of Yeats’s one-act play, At the Hawk’s Well, and after the publication of ‘The Wild Swans at Coole’ in 1919, Eliot softened his opinion of Yeats’s poetry. Yeats distanced himself from the passionate intensity of politics in Ireland until 1922, when he was appointed Senator in the new parliament of the Irish Free State, and was re-appointed for a second term in 1925. Meanwhile, in December 1923, he received the Nobel Prize for Literature. I think it is tragic that within three years of this country gaining its independence we should be discussing a measure which a minority of this nation considers to be grossly oppressive. I am proud to consider myself a typical man of that minority. We against whom you have done this thing, are no petty people. We are one of the great stocks of Europe. We are the people of Burke; we are the people of Grattan; we are the people of Swift, the people of Emmet, the people of Parnell. We have created the most of the modern literature of this country. We have created the best of its political intelligence. Yet I do not altogether regret what has happened. I shall be able to find out, if not I, my children will be able to find out whether we have lost our stamina or not. You have defined our position and have given us a popular following. If we have not lost our stamina then your victory will be brief, and your defeat final, and when it comes this nation may be transformed. But there was a nasty streak in Yeats too, and it should not be forgotten. His friendship with Ezra Pound introduced him to Benito Mussolini, whom he admired, and at one time he wrote three marching songs for Eoin O’Duffy’s fascist Blueshirts. Yeats died in France at the Hôtel Idéal Séjour, in Menton, on 28 January 1939, and was buried in the hilltop cemetery at Roquebrune-Cap-Martin. After the death of Yeats, Eliot was invited to give the first annual Yeats lecture to the Friends of the Irish Academy in 1940. In 1948, what was said to be the body of Yeats was moved in a coffin to Ireland on the naval corvette LÉ Macha. The operation was overseen by Maud Gonne’s son, Sean MacBride, who was then the Minister of External Affairs. Cast a cold Eye On Life, on Death. Horseman, pass by! But the bones moved from Roquebrune were never identified with certainty – his body had been exhumed and transferred to a communal ossuary sometime between 1939 and 1948, before the 10-year-lease on the grave had expired, and bones from other graves were mixed together. Some writers have identified the actual remains with those of a man Alfred George Hollis who died on the same day and was buried in the same graveyard at the same time. Come from the holy fire, perne in a gyre, And be the singing-masters of my soul.